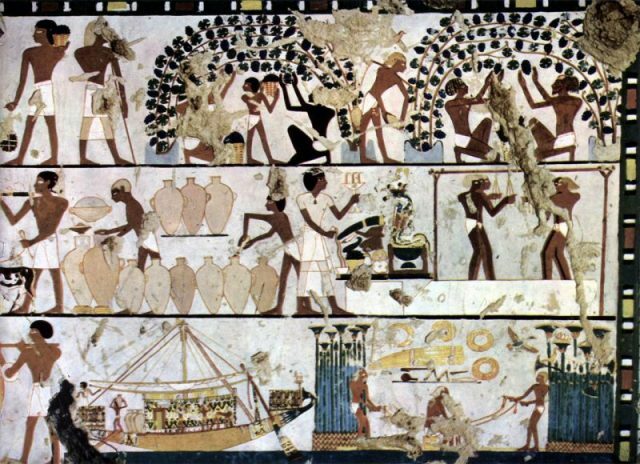 Wine production flourished in the days of ancient Egypt. Grapes but also other fruits such as figs or pomegranate were all exploited for winemaking purposes. Now, archaeologists have uncovered cellars, dated to two millennia ago, which stored the beloved social lubricant . The archaeological digs took place at the site known as Tel Kom al Trogy, north from the capital of Cairo in the country’s famed Nile Delta. Pottery shards and other evidence retrieved from the antique winery site suggest the place was used by workers on a regular everyday basis, according to archaeologists. 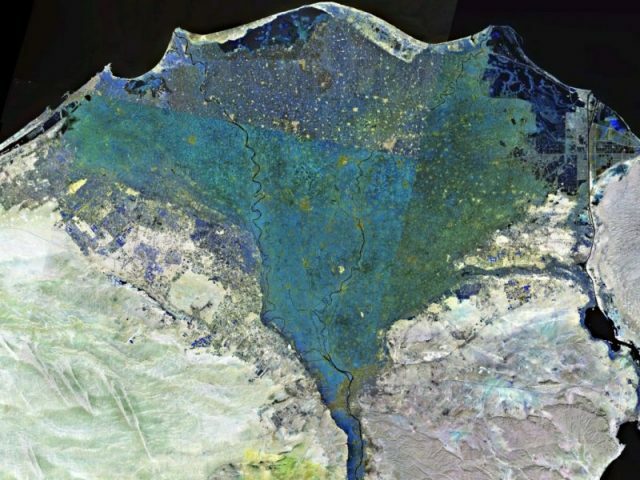 NASA satellite photograph of the Nile Delta (shown in false color). The storage rooms have intriguing architectural features, wrote the Egyptian Ministry of Antiquities in a statement posted on their official Facebook page on January 28th. Thick mud bricks were used to build the walls of the facilities, as well as randomly shaped blocks of limestone. According to Dr. Mostafa Waziri, the secretary general of Egypt’s Supreme Council of Antiquities, the limestone blocks may have been used to provide optimal temperatures for wine keeping. Grape cultivation, winemaking and commerce in ancient Egypt c. 1500 BC. The storage rooms seem to be part of a greater wine complex, some remnants of which had already reemerged during previous archaeological digs. Evidence from the latest excavation confirms the possible presence of more buildings lurking hidden in the area. These would have accommodated the people who worked at the winery as well as their superiors, Egyptian officials said. 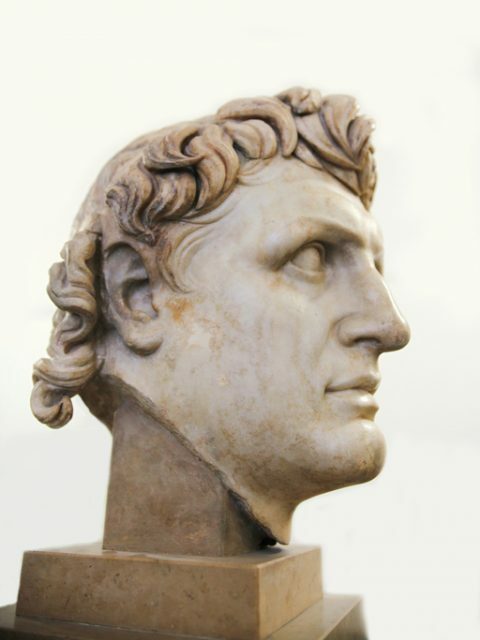 Besides pottery used during wine production, coins and other artifacts dated to different eras of ancient Egypt were also found at the winery premises, including from the Ptolemaic era that followed after the death of Alexander the Great in the 4th century BC, as well as the times of the Islamic conquest that took place during the 7th century AD. The winery site itself has been dated to Egypt’s Greco-Roman period, that spanned basically the same period (from the 4th century BC to the 7th century AD). 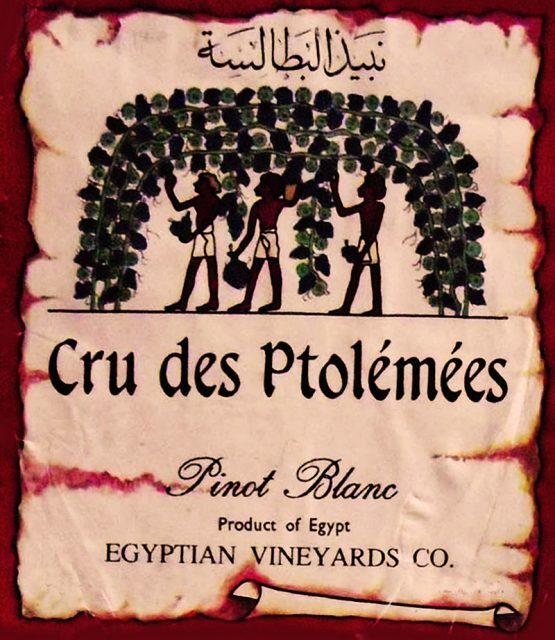 In this period, the region would have been a vibrant winemaking center, producing the finest of wines in the Nile region. The reputation of Egyptian wine was well established across the ancient world, however. Ancient Egyptians would prescribe the liquor divine properties. 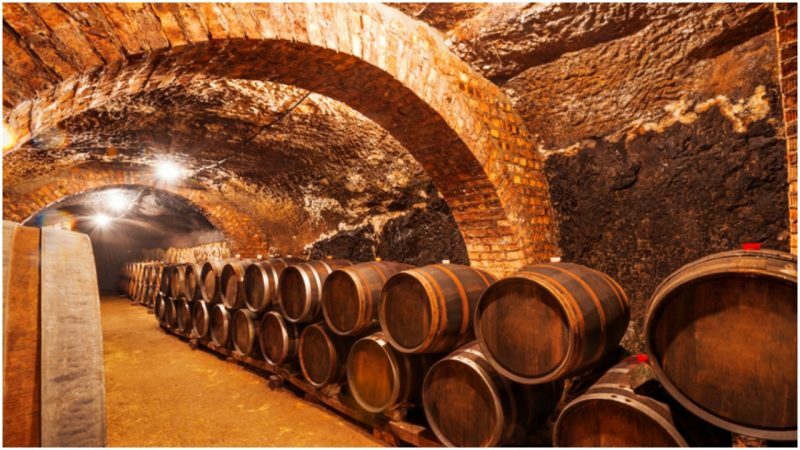 For the most part the owners of vineyards and wine houses were royals or high profile noblemen. The wine was seen as a luxury product, a drink of the affluent and a commodity kept for special occasions only. 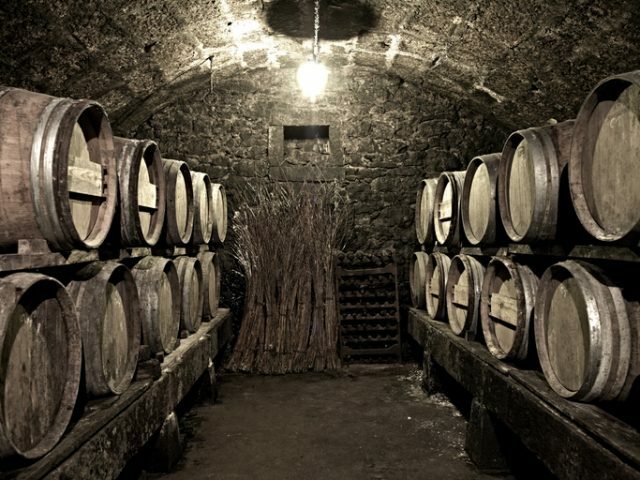 Antique wine cellar with old wine barrels. Ordinary people were able to consume wine at public festivities such as the festival of Hathor, a significant female deity from the Egyptian pantheon who was “closely associated with the primeval divine cow Mehet-Weret, a sky goddess whose name means ‘Great Flood’ and who was thought to bring the inundation of the Nile River which fertilized the land,” according to the website ancient.eu. One of the myths attached to the figure of Hathor tells of how the goddess’ bloodlust and rage threatened to destroy humanity. Commissioned by other deities to eliminate a faction of plotters, Hathor grew hungry for blood and continued killing — until she was deceived with wine as a substitute for blood. The culture of how wine was produced in ancient Egypt is intriguing enough itself. Vineyards and accompanying facilities to support the making and storage were always nestled close to areas rich with water. Each step of the way was meticulously thought through. For instance, to protect the previous fruits, young boys were hired to scare away the birds. Banquet scene from the tomb chapel of Nebamun, 14th century BC. Its imagery of music and dancing alludes to Hathor. The harvest was sometimes supported by monkeys that were trained to help. Once the harvest was gathered, it was brought to the winepress. Grapes were ripe by the Egyptian month of Piphi — between the summer months of June and July. Egyptian temples and tombs are abundant with portrayals which illustrate how the wine was cultivated. 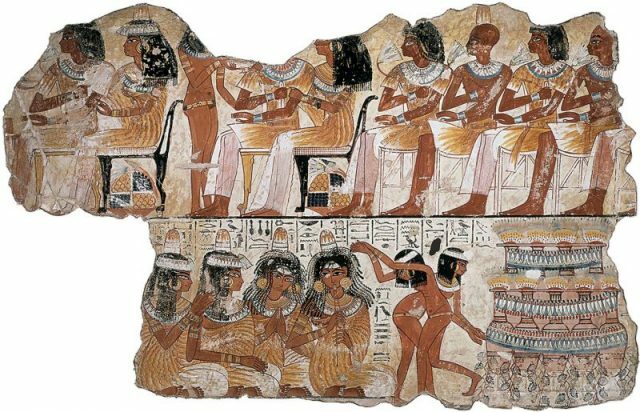 Besides its function as a social lubricant, ancient Egyptians additionally used wine for medicinal purposes such as to heal a cough, as an antiseptic, and even to help relieve pain during childbirth.